It was a perfect tea drinking day – cold, crisp, sunny. The 2015 Vancouver Tea Festival, held on November 21st at the Croatian Cultural Centre, hosted more than 3,500 attendees and featured 31 vendors from across British Columbia and the northwestern US. Exhibitors at the festival included: Thay Tea, The Tea Sparrow, The Tea Spot, Amoda Tea, Ichiyo’s Matcha Bar, Aromatica Fine Teas, The Teaguy, O5 Tea, JusTea, Steeped Tea-One Falling Leaf, The Chinese Tea Shop, The Tea Association of Canada, Oollo Tea, Davids Tea, Chado Tea House, Shaktea, Cultivate Tea, My Matcha Life, Young Mountain Tea, Sugimoto America, Trudy Ann’s Chai, Six Mountains Tea, Yuan Chen Premium Tea Collection, Karla’s Specialteas, Crimson Lotus Tea, Wize Monkey, Pure Leaf Real Brewed Tea, Namasthe Tea Company, Capilano Tea House and Botanical Soda Company, and Lumbini Tea Lounge. Many vendors debuted new products at the festival. Capilano Tea House & Botanical Soda Company premiered its new botanical soda line featuring flavours such as lavender ginger, rose lemonade, and cranberry rosemary. JusTea featured unique, triangular shaped packaging for its line of handmade Kenyan teas. Wize Monkey brought new flavours – Minty Marvel and Mango Party – of their Nicaraguan coffee leaf tea (yes, tea made with coffee leaves!) Young Mountain Tea of Eugene, OR, unveiled a white tea from the Kumaon region of the Indian Himalaya – a new tea terroir they have been instrumental in developing. As part of the Festival’s mandate to promote tea education, the day featured educational presentations and tasting sessions. Louise Roberge of the Tea Association of Canada began the day with an introduction to specialty teas. The health properties of tea were the subject of an informative presentation by Nicole Armstrong of Nicole Dawn Yoga & Wellness in Seattle. Karen Cayen of Aromatica Fine Teas focused on cooking with tea. She suggested using tea as another layer of flavour in recipes – for example, she recommends sautéing prawns with Lapsang Souchong. Jenny Lo of Oollo Teas and Raj Vable of Young Mountain Teas shared expertise on Taiwanese oolongs and the teas of India, respectively. Grayson Bain of Justea told the fascinating story of the founding of his company and the Kenyan tea industry. Finally, Mike Menashy of Tea Sparrow presented on tea cocktails, using many of the tea blends available through his tea subscription service. 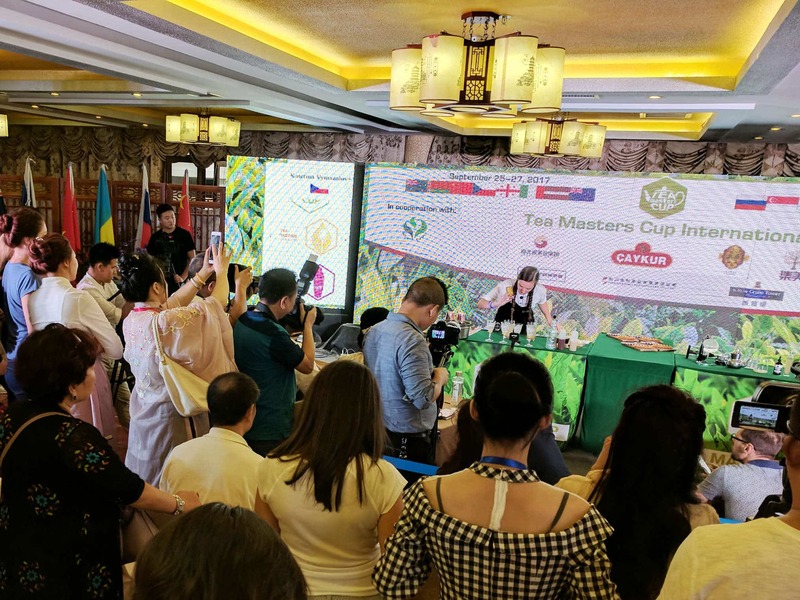 The tasting sessions included featured teas from Taiwan, Korea, and China’s Fujian Province, as well as samplings of matcha and raw pu’er teas, and a special tea evaluation class headed by Tea Master Jason Chen of Seattle’s Smacha Tea. Each vendor bought a unique dimension to the festival – from wild-crafted botanical teas to matcha, to oolongs, to blended teas and chai; India, China, Japan, Sri Lanka, Taiwan. There was something for everyone, from the tea drinker who likes to keep things simple to those who prefer an exotic adventure in their tea cup. Planning for the 2016 festival is already underway. Watch for updates at www.vancouverteafestival.ca. It’s not a festival without some steampunk fashion! Glen Bowers of Crimson Lotus Tea (Lynnwood, WA) serves up pu’er tea to Del Tamborini, executive director of the Vancouver Tea Festival. Glen hand-carved the tea table pictured and hand-forges his own pu’er knives. Calli O’Brien of My Matcha Life whisks up some matcha. They also sampled matcha shortbread. Daniel Lui of The Chinese Tea Shop sampled teas from across China, brewed ‘gong fu cha’ style. To see a list of upcoming tea festivals, see this post. Theresa Gebrail is a Vancouver-based communications professional and freelance writer who is studying to be a Tea Sommelier. She is obsessed with finding the perfect Earl Grey tea.